The scenery is wild and striking. Huge, spectacular cracks along the road prove that those old B-grade movie earthquakes do exist. Volcanic waters burst from the earth and stream down the cliffs forcing your bus to slam on the brakes. The shifting earth is alive here. It’s beautiful, but not the kind of place that you expect to find luxury. 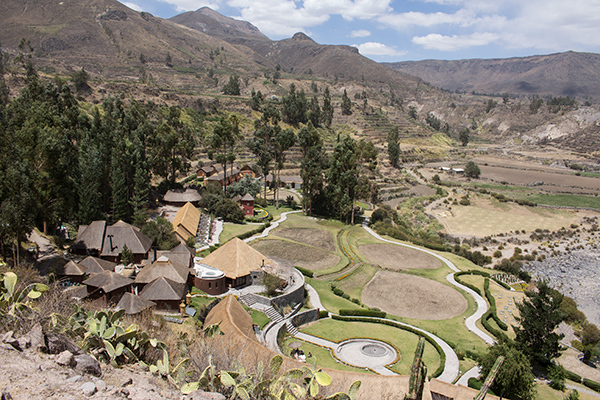 Then again, Colca Lodge is not your typical hotel. For months now, we have been hearing about it. More than once, we have heard things like, “Don’t miss Cusco, Puno and Colca Lodge,” as if the lodge itself were synonymous with Peru’s most famous canyon. To be honest, we were a bit worried that the luxury hotel could never live up to the hype. But from the moment we arrived, we realized those descriptions hadn’t done the hotel justice. Set on an isolated stretch of the Colca River outside Yanque, the grounds are absolutely gorgeous. 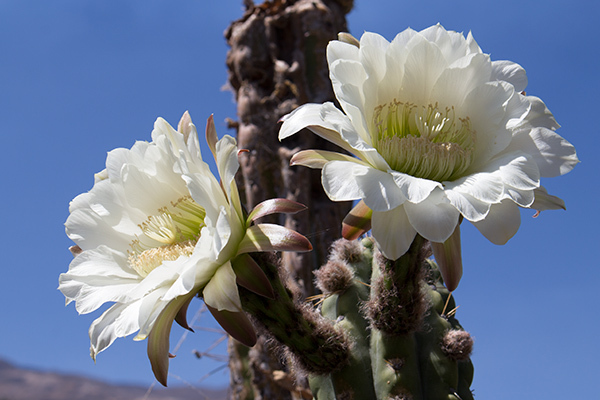 The walking paths are lined with fragrant flowers, and hummingbirds dart in all directions. 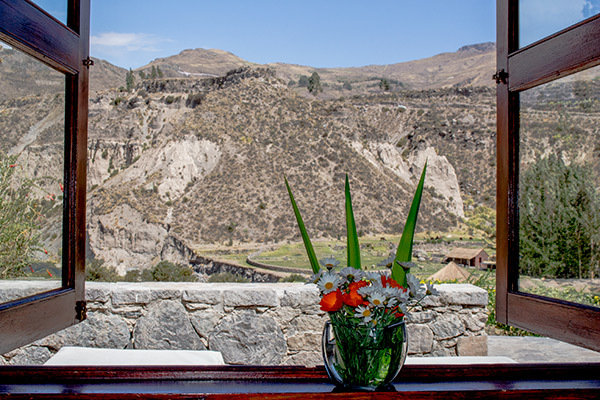 Our room has a large window and a terrace overlooking the hotel’s quinoa fields, the Colca River, and the canyon walls beyond. As if the idea of landscaping a luxury hotel with quinoa fields isn’t genius enough, the lodge also has its own llama and alpaca farm where they are currently contributing to an ongoing project to help genetically recover vanishing purebreds commonly used by ancient Peruvians. 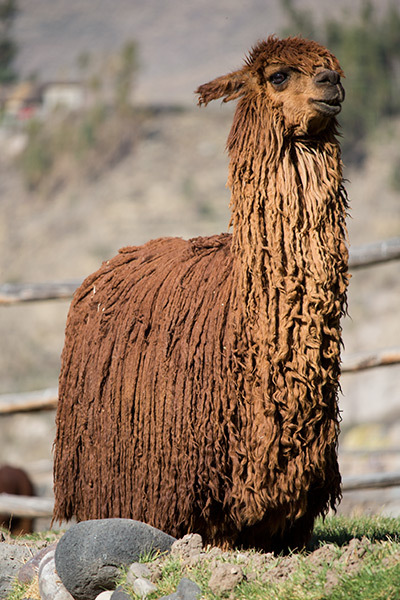 By far, our favorite breed was the gorgeous suri alpaca, which has a certain Rasta flair. The beautiful setting and the alpaca farm are definitely key attractions, but what really brings in the guests are the lodge’s private hot springs. What some of you may not know is that Thomas and I are total snobs when it comes to two things in this world, beaches and hot springs. We like them simple and natural. So what did we think? 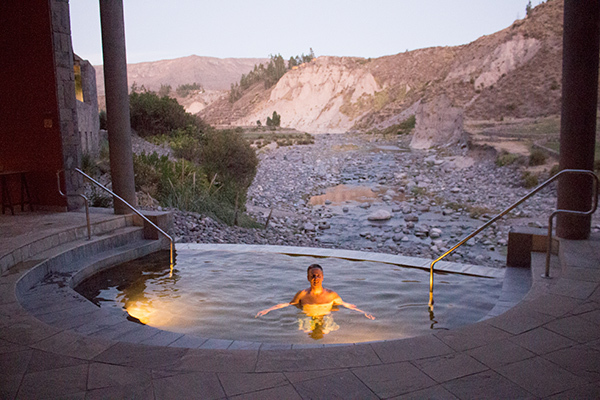 Colca Lodge’s hot springs are, in our opinion, about as perfect as it gets. The four terraced pools, which overlook the Colca River and the alpaca farm, provide plenty of space for guests to stretch out and enjoy the waters. Pool walls are all done in natural stone to integrate into the surrounding boulders. There’s also a small unobtrusive bar in case you need a glass of champagne while you are soaking. Best of all, the lodge’s hot springs area is open 24 hours a day. Surprisingly, Thomas and I seemed to be the only ones taking advantage of the pools after 9 PM. 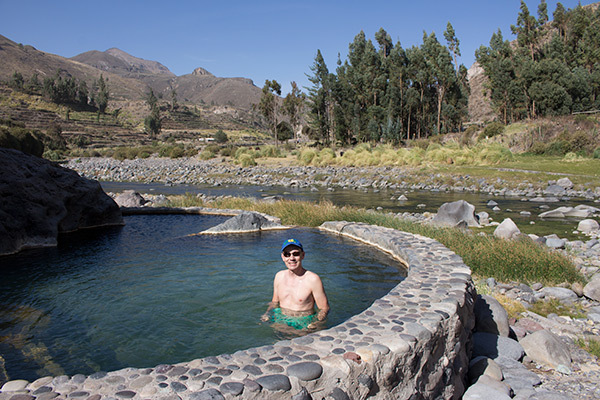 Because the hot springs are so enjoyable, it really is very tempting never to leave the lodge, but with the incredible number of cool attractions in the Colca Canyon area, you really need to drag yourself out of the pools. The one excursion which virtually every visitor chooses is the trip out to the Cruz del Condor, a dramatic viewpoint overlooking the deeper, steeper portions of Colca Canyon. The dramatic views of the plunging gorge are reason enough to visit, but the viewpoint is also the best place in Peru to view the endangered Andean condor. June to September large numbers of condors, which boast an impressive wingspan of over 10 feet, are viewed on a daily basis. But later in the season, it’s more of a hit or miss experience. It’s worth noting here that how you visit the Cruz Del Condor can make a huge difference as to whether you see the birds, or not. People using public transportation or taking day trips from Arequipa tend only to visit the official Cruz del Condor viewpoint. 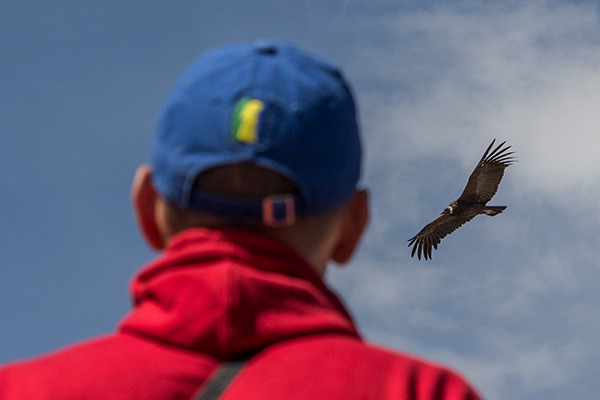 Local tour operators know the area much better and they normally track the daily behaviors of the condors, so they often take their passengers to alternative viewpoints to increase their chances of seeing the birds. 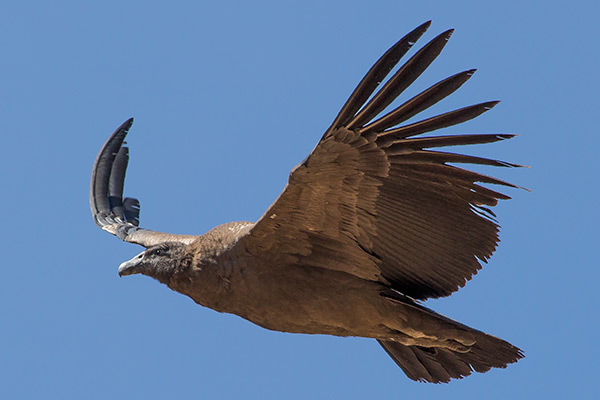 On the day we visited, no condors were spotted at the official Cruz del Condor viewpoint. But because we were on a local tour, we ended up seeing a dozen or more at alternative sites. Not too shabby considering we were off-season. Sometimes, it really does pay just to take an organized excursion. The organized condor trips also stop at scenic viewpoints overlooking some stunning terraces as well as the colonial church in Maca. It’s also great to glimpse a bit of village life along the way. While the tours do allow you to see a bit of the local culture, it really is far more rewarding to get out and explore the villages around Colca Canyon on your own. Locals are super welcoming and many people still dress in colorful traditional clothing. In fact, the women here have some of the most photogenic dresses we’ve seen in the Andes. Also ask about festivals or rituals in the surrounding region. Our visit happened to coincide with the unique fiesta of the Inmaculada Concepción in Chivay when locals fill the streets for five days dancing the Wititi. The traditional dance involves local men dressing as women to secretly court the women they desire. 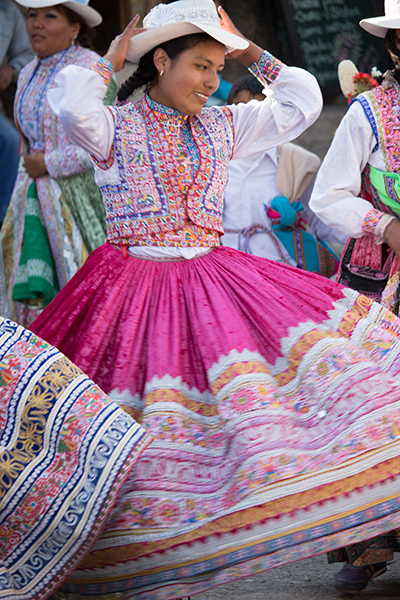 The spectacle peaks late each evening when thousands of couples dressed in beautiful traditional clothing fill the Plaza de Armas stomping rhythmically to tubas and tribal beats. Another outing that tore us away from Colca Lodge’s hot springs was a three-hour horseback riding trip which took in some of the highlights near Colca Lodge. Our guide led us via a steep, rocky trail up into the mountains behind the lodge to several viewpoints with mind-blowing panoramas of the terraced landscapes around Yanque. We posed and played cowboy the whole way, although I suppose cowboys didn’t carry GoPro selfie sticks. From there, we continued to a lookout above the pre-Incan ruins of Oyu Oyu. Riding along through the desert canyon landscape with cactus along the trail and ancient ruins in the distance was one of the most magical moments I’ve experienced in Peru. I’m pretty sure Thomas felt the same way. 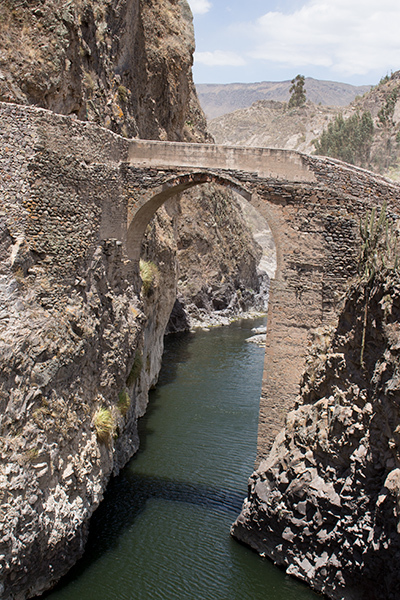 We continued down the mountain and entered the hair-raising Colca River gorge just before Yanque. We are not super experienced riders, so balancing on the back of a horse while it slips and slides down a narrow trail on the side of a steep cliff definitely caused the adrenaline to spike. I tried to stop the horse to get a picture of the trail and the suspension bridge we were about to cross, but the horse would have none of that. Clearly, the horse was far more focused on not dying. 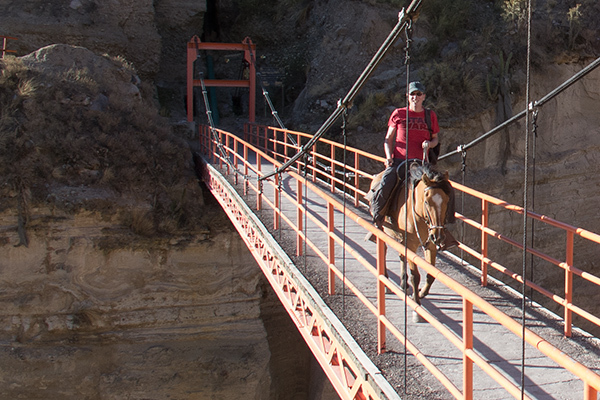 From the gorge, we cowpokes mosied through the dusty streets of Yanque past the old stone church and crossed back over the Colca River via the beautiful old stone bridge downriver from the lodge. For me personally, the horseback ride was BY FAR the coolest thing we did in the region. But boy, were we aching when we got off those horses. Bowlegged and bent, our hiking boots covered in dust, we sauntered into the lodge and confirmed our spa appointments. In the interest of science and because we are so dedicated to our readers, we forced ourselves to visit the spa and get Swedish messages. (We are so selfless!) The masseuses are local women who have been professionally trained in various message techniques. Both of our massages were excellent, although the ladies did seem rather baffled by our attempts to prop up a tripod in the massage room to photograph the session for the blog. In fact, you can see us hard at work in the picture below. And the best news of all, since the masseuses are from the surrounding area, you are not only helping to save the environment, you are also helping to employ the local population. In a sense, getting a massage here is virtually an act of altruism rather than self-indulgence, right? Not getting one would practically be selfish. It’s important to point out that due to the wonderfully isolated location of Colca Lodge, most guests will probably be dining at the hotel’s restaurant called Puye. That’s no problem because the food is great. From the breakfast buffet to those post-adventure dinners, we enjoyed it all. The menu focuses on Alpandina cuisine like grilled trout or rösti with champignons. 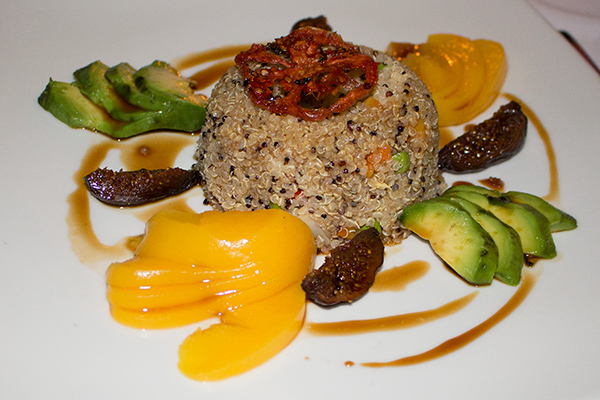 There’s also a nice selection of interesting international dishes reflecting local flavors like tabouli-style quinoa with figs, avocado and peaches as well as a comprehensive drink menu to keep everyone happy. Beyond food, our junior suite was one of the largest, most comfortable rooms we have had the pleasure of staying in during our time here in Peru. The bathroom was enormous; we literally could have pitched a tent in there. Thomas gave the sumptuous king-sized bed his highest rating. 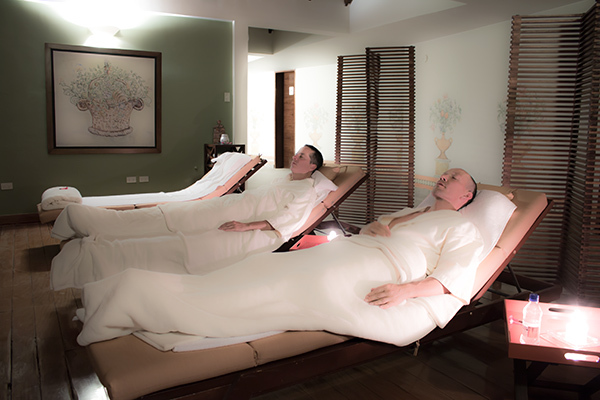 We both also had a great time posing like ’40s movie stars in the white robes that guests are given for their walks to the hot springs. Like I said at the beginning of the post, we’ve been hearing about Colca Lodge for months and wondering if it really could ever live up to our expectations. That might seem like a strange thing to say considering our history of adventure travel. Regular visitors to our site know that we have stayed in everything from thatched huts to luxurious beachside resorts. So why worry about expectations? Yes, everyone loves great food and a beautiful room, but we are looking for real destinations as well. We look for creativity, hospitality, culture, natural beauty and, most of all, we look for adventure. In all those categories, Colca Lodge passes the test. Cultivating quinoa and breeding rare alpacas at a luxury lodge – that is some serious creativity. 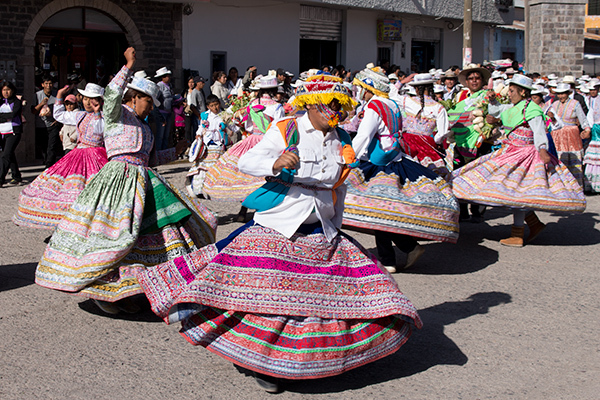 The Colca region with its traditional villages and phenomenal landscapes is the embodiment of culture and natural beauty. And the potential for adventure is virtually unlimited (wait till you see our next post). Hmmm, can you tell we liked it? 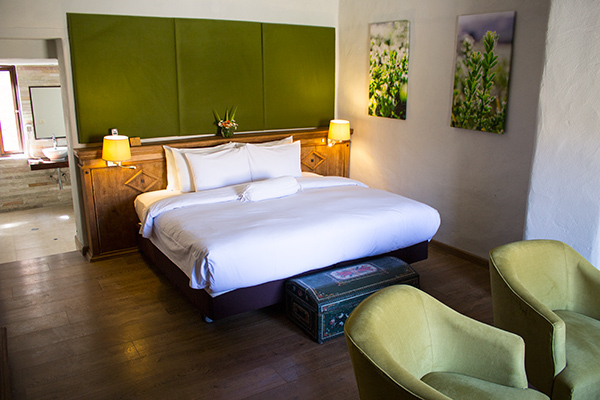 If you would like to find out more about Colca Lodge, their rooms, restaurant and spa offerings, visit them at www.colca-lodge.com. Disclosure: We were guests of Colca Lodge during this experience. However, all of the opinions expressed here are our own. The horse back trip sounds like a real kick! We can´t wait to hit the trails. @Marco, Definitely don’t miss it – we had an absolute blast. Going up and down those steep trails on the horse was a real adrenaline kick (which isn’t really shown in the video because we were holding on at those points). 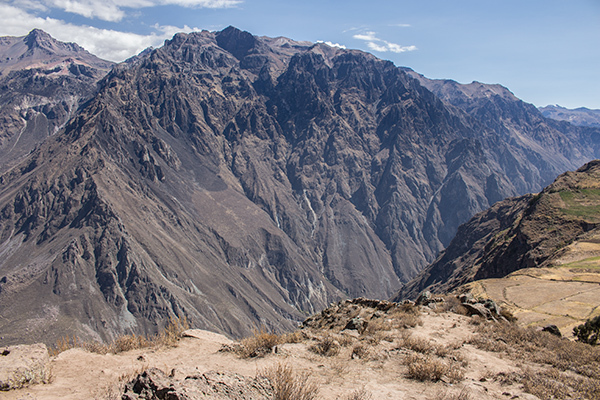 This sounds like the perfect Colca Canyon experience. I wish we had known about the lodge when we visited because those hot springs look fantastic. 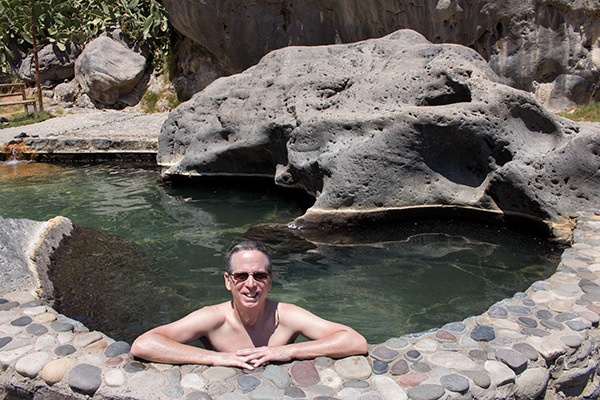 @James, The springs were fantastic – one of the most relaxing places we visited in Peru. Don’t miss them if you head there. 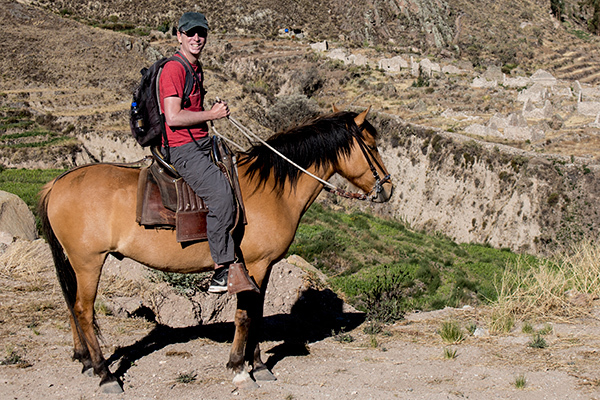 Did you organize the horseback riding through Colca Lodge? 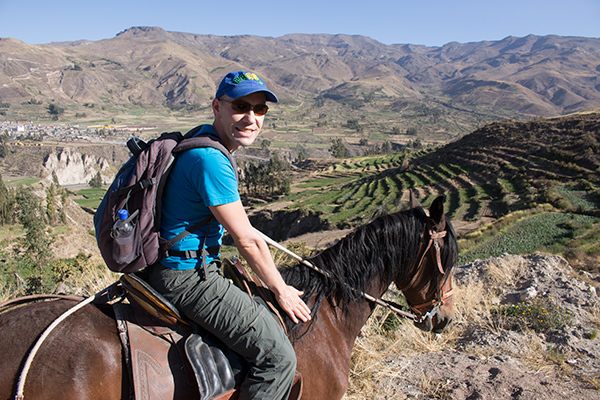 @Scanda, Yes, we did organize our horse ride through Colca Lodge. If you are not staying there, ask around in Chivay or Yanque for horse trips. Tell them you want to ride to the viewpoint overlooking Oyu Oyu. Thanks for this report on colca canyon. I did not know this place until I read your report. It sounds very good. I hope I can go when I visit peru. Where is that stone bridge? Is it close to Chivay? Your stay in Colca was certainly way more luxurious than mine. I’m envious of the horse trip and those hot springs. Sounds like you guys had a great visit. Hope to see you on the road. That horse trip was a real highlight and so were the hot springs. You should be envious. 😉 Hope we cross paths again. Great hot springs! Can you visit them if you aren’t staying at the hotel? I believe you can visit the hot springs even if you are not a guest at the lodge. 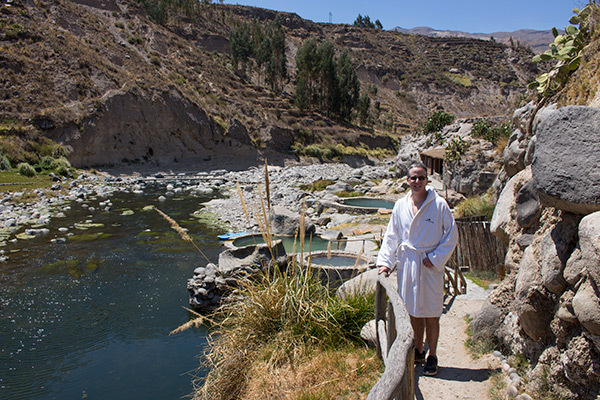 Colca Lodge also has an amazing spa, so I’m sure all of this is available for outside guests. I would contact Colca Lodge directly to confirm, find out about prices and transportation to the lodge. I am looking to stay at the Colca Lodge but also want to take a trip to the Cruz del condor and possible do trek of the canyon for a couple of hours. But I have not been able to find any tours or treks that leave Colca Lodge or yanque instead of Arequipa. 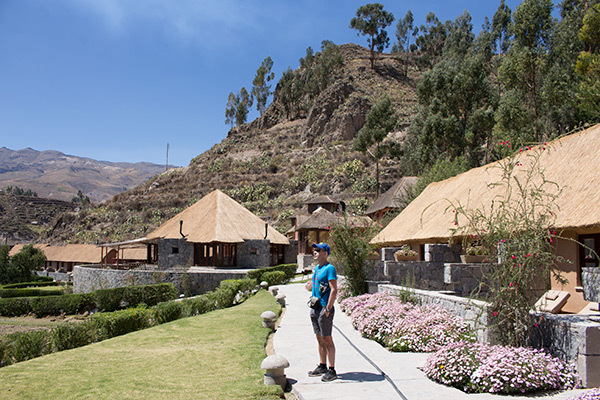 Is it possible to book a day tour or trek once you arrive at the Colca Lodge? You can book all of your tours at Colca Lodge. We arranged the horseback riding to the Oyu Oyu ruins and the condor trip with the lodge while we were there. When you book your stay, I would inquire with them directly to see what’s on offer and to find out about availability. Prices were fair and the quality of the tours was excellent.